If you could pick a superpower what would you choose? Extraordinary strength? Extrasensory perception? Exceptional intelligence? How about the ability to predict the future? Or at least the weather? It would be so much easier to plan and plant a garden each year if we only knew what the growing season had in store. Is it going to be a very long, cold, and wet spring with a frost at the end of May? Then the warm weather crops shouldn’t go into the ground until the start of June when the soil will be warm and dry enough to encourage germination of seeds such as beans which do not like cold, wet feet. Will a lack of precipitation stunt plant growth and require more supplemental watering than usual? 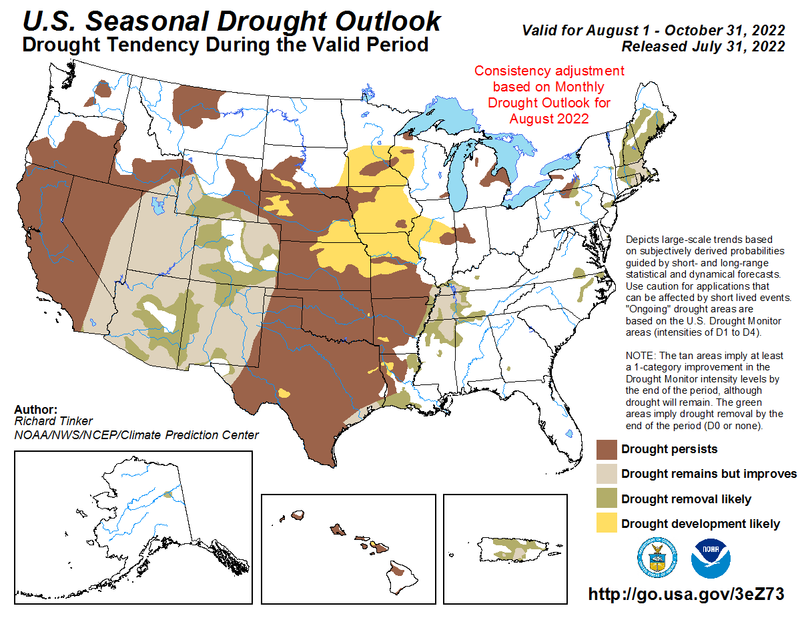 It’s no surprise to anyone at this point that Connecticut is experiencing drought conditions that range from abnormally dry to extreme drought conditions in the western part of the state according to the USDA. The National Weather Service Seasonal Drought Outlook only extends through February 28, 2017 at this point but it predicts that the drought will persist in the Northeast based on “subjectively derived probabilities guided by short- and long-range statistical and dynamic forecasts”. Say that three times fast! The National Weather Service, which is a division of the National Oceanic and Atmospheric Administration, was formed in 1970 under President Richard E. Nixon’s administration. Prior to that date they were known as the Weather Bureau (forms 1870) and before that, the United States Coast and Geodetic Survey (formed 1807). It’s safe to say that NOAA has the most up to date weather technology including geosynchronous satellites, Doppler weather radar, and undersea research centers. But even with that technology most predictions are only up to 90% accurate for 6-10 days out. Past that it becomes probable trends based on current and past information. And yet, for 225 years, there has been a resource that claims that its weather forecasts are 80-85% accurate. Since 1792 the Old Farmer’s Almanac has been a go-to resource for weather, astronomy, gardening, cooking, and predictions of trends in food, fashion, and technology. About that weather accuracy claim: the Old Farmer’s Almanac has a closer to 50% predictability rate. But that doesn’t stop thousands of readers, especially in the pre-National Weather Service days, from using it as their planting and growing guide. Its folksy character is a large part of its charm. Not to mention its compact size and unique punched hole in the upper left-hand corner for hanging from a nail or string in the outhouse. I pause for a second to express gratitude for modern indoor plumbing. And now, spoiler alert, here are the Northeast predictions for 2017 from The Old Farmer’s Almanac: Although there will be lower precipitation than normal in January it will be at or above normal for February through July with temperatures 1-4° below normal for most of that period. Pretty much the opposite of what 2016 brought us. But what stands out the most is the blizzard accompanied by bitter cold that is predicted for February 11-17. Let’s hope that one isn’t correct!